Stainless steel bell rings. Material: Surgical Stainless Steel. Ball size: 5mm/6mm. Fully showing your special taste and personality. Material: 316L Surgical Steel. Stunning belly bar. Bar length: 15 mm (Approx.). 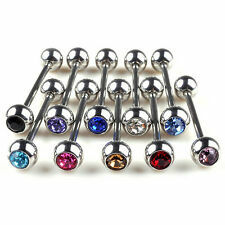 TYPE: Body Piercing Jewelry. Ball size:6mm. Total length with ball:app 3.1cm. Gauge: 14g. Quantity: total10pcs. Color: Randomly send.